Director: Bart Freundlich. 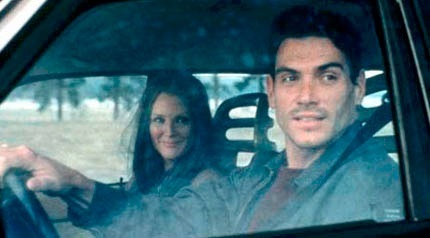 Cast: Billy Crudup, Julianne Moore, David Keith, Francie Swift, Cleavant Derricks, Mary McCormack, Karen Allen, Liane Balaban, James LeGros, Nicolas Suresky. Screenplay: Bart Freundlich. Twitter Capsule: Freundlich's vinegary character studies bravely swim against the tide of warmer indies. They're just a bit airless. VOR: ② Puzzling call: a better-than-okay movie that's just too familiar? Or a not-great film that's only notable for unusual tone and perspective? Only a must for Moore, Crudup fans. After two full-length features, writer-director Bart Freundlich remains an American independent-film experiment that may or may not come to fruition. His previous feature, 1997's The Myth of Fingerprints, collected a bushel of attractive, interesting actorsBlythe Danner, Roy Scheider, Noah Wyle, Hope Davis, Michael Vartan, Brian Kerwin, Laurel Holloman, and the auteur's future companion Julianne Mooreto spin a quiet, insinuating story of the almost silent resentments percolating beneath an affluent family's Thanksgiving. The film worked on its own talky, angsty terms, and I have returned to it in my mind more often in ensuing years than I expected I would. Granted, the eminent, wintry tastefulness of script, cast, and décor occasionally made the project seem like the world's saddest J.Crew commercial. My most pressing curiosity after Myth was whether Freundlich could imagine a world and a dramatis personae outside the realm of earth-toned, pressed-and-pleated domestic dysfunction. World Traveler leaves that question open, which at least suggests internal consistency, because World Traveler leaves open just about every question it raises. Essentially a road movie, the narrative follows a New York architect named Cal (as in callow?) as he follows a sudden impulse to flee his carefully creased existence in Manhattan for no destination in particular, and for no precisely defined reason. The grand tradition of premature midlife crisis teaches us that Cal feels suffocated, trapped, unequal to people's sudden expectations of him, doomed to repeat inherited patterns, yadda yadda, though we still hope the film will find new ways of telling us these things. So, Cal jumps in the car one afternoon, just as his wife Joanie (Francie Swift) and young son Leo (Nicolas Suresky) are scheduled to arrive for the boy's birthday party. He doesn't look back, though he has guilty hallucinations of Joanie and Leo along many of the routes he follows toward the other coast. Along the way, Cal encounters a gallery of modestly off-beat typesquirky in a way that transcends the increasingly suspicious cutesiness of that term. Eventually, near the film's end, Cal winds up in the Oregon cabin where his own father relocated decades ago, after pulling exactly the same domestic disappearing act Cal has just performed. Billy Crudup as Cal and David Keith as Pop stare at each other, orbiting each other on the way toward some familiar recriminations, confessions, and drawn expressions. From all this, Cal gleans something that, in his bottomless mystery, he feels he needs to glean, leading to the film's characteristically cryptic conclusion. World Traveler doesn't lack an ending, but it does truncate its conclusion right at the moment we might learn something about how deeply or genuinely Cal has been absorbing all the run-ins and conversations he's been having along his yuppie pilgrimmage. Our extremely limited access to Cal's psychology is a blessing that becomes an annoyance. How gratifying to find any American film that does not gravitate around relentless exposition, over-definition of its characters, or a compulsive need to ingratiate us into its universe. And yet, and yet, Freundlich really tests our limits with a film that, while side-stepping some conventions, doesn't make a strong enough case for the road less traveled. Lots of dramas have done well portraying enigmatic characters, even characters who are enigmatic to themselvesand many of these same actors have appeared in those pictures, people like Crudup (in Waking the Dead), Mary McCormack (Full Frontal), and of course Julianne Moore, who has all but constructed her brilliant career playing women who barely exist, or barely grasp their existence. Dulcie, the tanned and brunette drifter Moore contributes to this film, is one of its most vivid creations, a sharp spike in the film's pulse and a welcome addition to Moore's odd portfolio of roles. Cal's scenes with Dulcie also showcase Freundlich's gifts for slippery, interesting dialogue; their dinner conversation at an upscale restaurant is weird and absorbing, because while both of them make real efforts to be frank and forthcoming, they are consistently baffled by each other's remarks. Dulcie asking Cal what kind of car he drives, having just been ferried to dinner in that very vehicle, and having just been given a much more compelling morsel of information, is a gorgeous moment. But Dulcie's subplot wobbles as the film gets more explicit about who she is. World Traveler as a whole has the same problem: it is more captivating as it opens than as it concludes. Put another way, the movie sounds interesting in concept but drags in execution, and everyone in it is more interesting the less time we spend with them. James LeGros, another Myth of Fingerprints vet, engages Cal in a nervy, veiled confrontation in the Minneapolis airport, but the scene is two minutes too long, and the character's secret motivations are spelled out too fully. Meg, a teenage hitchhiker that Cal has picked up on the way to Minnesota, is a charming creation of the filmmaker and performer, but Freundlich bungles her exit from the movie, including too many cutaways to her once her role in the plot and in Cal's life has already evaporated. Crudup, an interesting if perhaps over-celebrated actor, doesn't seem totally reconciled to the level of inwardness Freundlich has assigned to the character. He indulges in some Brandoish gesticulationsbanging the roof of the car while he drives, screaming to no onethat seem intended to give the character or at least the performance vitality and unpredictability. They just don't feel true. And while that impossibly cheekboned, black-eyed face of Crudup's is quite a thing to look at, it doesn't give much emotionally. The theater, as in Crudup's recent Broadway embodiment of The Elephant Man, may actually be the medium for him, focusing his interesting physical restlessness and making the handsome carapace of his face less of an impediment. In any event, the fact that we never quite care about Cal may reflect not just an error in Freundlich's handling of World Traveler but an instance of vexed casting. Crudup is utterly plausible as the husband and father who can't or won't hack it (I am referring to more than his own, unfortunately publicized career as a runaway partner), but he's not an actor given to illuminating his own opacity, if that's even what Freundlich wants.